A sudden pyroclastic flow erupted in Japan on September 27th, sending hikers fleeing to the dubious safety of mountain lodges. Here's an update covering your questions on what happened, why we didn't predict it, and what you could do to survive. Top image: Nagoya City firefighters (orange) and Japan Ground Self-Defense Force personnel (camo) climb Mount Ontake to search for survivors on Sunday, September 28, 2014. Credit: AP Photo/Nagoya City Fire Dept. I described a pyroclastic flow as a rolling cloud of murder, which, while entirely true, lacks scientific nuance. Pyroclastic flows are high-velocity, high-temperature tephra density currents. That means they're a mix of shattered rock and ash heated up to 1000°C, hot enough to burn bone and melt silver, that race down volcano slopes at up 200 meters a second in a swirling, fluid mess of turbulence. They aren't tidy, either: they fling rock and ash in boiling clouds all around the flow, reaching out to smother victims with ash, pelt them with rock shards, and poison them with toxic gas. Even taking into account that this was relatively small and slow (80 m/s) for a pyroclastic flow, the only way to stay safe in the face of that kind of raging force of nature is to be somewhere else. Why didn't we get warning about this eruption? Mount Ontake is one of 47 continuously monitored volcanoes in Japan. That's a good first step — we can't say the same for all active volcanoes in the United States — but it's also not a guarantee of getting a solid warning prior to eruption. In the week before the eruption, the volcano was generating some minor seismic signals. However, they were easily attributable to an uneasy sleep, the type of seismic activity common to volcanoes worldwide up to nothing more sinister than a bit of subterranean magma shifting. It was certainly nothing that screamed out a clear warning of impending doom. No ground deformation was measured, which is one of the key signs of magma rising underground before an eruption. From all observations released so far, that's entirely consistent with this being a phreatic eruption: an eruption triggered by water explosively flashing into steam. Unfortunately for us, phreatic eruptions produce very few warning signs that something bad is about to happen. The lakes and ponds on the volcano may have increased slightly in temperature, but that's about it. The failure to warn wasn't a problem with the science, or human warning systems, or anything else we can control: it was a basic characteristic of the eruption. How did the eruption kill people? This eruption took place on a crowded Saturday morning, when the volcano was crowded with an estimated 200 to 250 hikers. Police, firefighters, and military forces have been searching the mountain all week, pulling survivors off the mountain, and, more frequently, retrieving victims for identification. The official death toll is currently at 47 with no bodies awaiting transportation off the volcano, but as no one knows how many hikers were near the eruption, it is plausible that the count may still rise. The search has been repeatedly halted due to increased risk in environmental conditions, including increased seismicity threatening another eruption. As of Friday, sixteen people are suspected missing, but the search was called off due to rain and the risk of it mobilizing ash landslides. For now, police are describing the cause of death as from "disaster," without specifying what happened. Even so, we know bodies were found buried in up to half a meter of debris, with visible impact trauma, poisoned by the gas, choking on ash, or with lungs scorched from inhaling hot air. While the death count is grim, the survival rate is shockingly high. Most of the survivors found shelter, huddling behind boulders or even getting inside tourist lodges. The nearly 70 people injured in the eruption share common injuries: bruises, cuts, and broken bones on their backs where they were struck by flying rocks, some also suffering internal bleeding and organ damage from the impacts. An attempt to shelter was no guarantee of safety: bodies were found wedged in rock crevasses or kneeling in protective curls. What could people do to survive? This eruption was a tragedy without warning, and the only guaranteed way to survive was to not be on the volcano. But what could you personally do to increase your odds of survival if you want to hike an active-but-quiet volcano? Let people know where you're going and when you'll be back, so we know to look for you. This is a good tip for all hiking, not just those with the risk of eruptions. Bring basic survival gear. Pack a first aid kit, water (and more water! ), and flash light. Search and rescue workers would love it if you also packed a way to contact them if you're stranded (phone and the appropriate number), anything high visibility, and a noisemaker (whistle) to help them locate you. Bring eruption survival gear. Pack goggles to help you see through ash, a particle mask to protect your lungs, and a helmet to protect your head from flying rocks. No goggles? Use sunglasses. Caught without a mask? Cover your mouth and nose with your clothes. This won't protect you from being roasted, being poisoned by gases like sulfur dioxide, or major impacts, but it might keep you alive long enough to get to shelter. Learn about your volcano. Find out the eruptive history, its current status and monitoring programs, any active warnings, and whatever else you need to make a solid risk-benefit analysis on if it's worth it to climb this particular volcano on this particular day. Considering Mount Ontake's relatively gentle eruption history, this advice wouldn't have benefited many of the climbers unless they'd forgotten the mountain's volcanic nature. Learn about your environment. 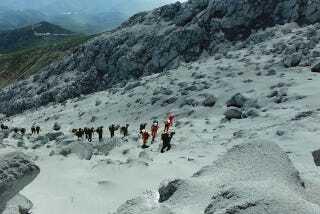 Many of the survivors in the Mount Ontake eruption managed to find shelter from the flying rock and smothering ash. While your hike will obviously have some priorities beyond, "Where will I go if this thing erupts? ", pay attention to the location of buildings you could shelter in and alternate paths down off the volcano. Again, this is useful for more than just eruptions: knowing where to shelter is invaluable when delayed by an injury, cut off by a landslide, or hiding from inclement weather. Life is full of risks, and the world is full of impending disasters. You make choices every day on what risks are worth it to you, from where to live (earthquakes or tornadoes?) to how to spend your time. You can't eliminate risk entirely; you can only decide which risks are worth taking, and how you want to mitigate them. The Mount Ontake eruption is undoubtably a tragedy, and I've put off writing this update all week so I didn't need to face the climbing death count of lives cut off on a sunny Saturday while out enjoying a brisk hike. Yet, the hundreds of people who somehow survived one of the scariest classes of natural disasters I've studied, are a testament to living even when the odds are stacked against you.